PNC Mortgage (also billed as “HomeHQ”) is the mortgage division of PNC Bank. It’s the sixth-largest bank in the U.S. with total assets of $357.8 billion in 2016, according to the Federal Reserve. In 2015, PNC had a total loan volume of $17.0 billion, coming in at No. 11 in the U.S. for loan volume right behind Caliber Home Loans and ahead of Stearns Lending. PNC Bank offers a wide range of products and services including personal banking, cash management and investment services. PNC provides services not only for individuals, but also small businesses, corporations and government entities. PNC’s history can be traced back to the 1800s with a series of banks in Pittsburgh. Modern-day PNC was formed in 1983 after Pittsburgh National Corporation and Provident National Corporation merged. After establishing itself as the largest bank in Pennsylvania, PNC expanded to other states through a series of acquisitions. Today, the bank still has its headquarters in Pittsburgh, and has 2,600 branches across 19 states in the eastern half of the U.S.
PNC Bank is a publicly traded company and also owns a minority stake in BlackRock, one of the largest publicly traded investment management firms. What Kind of Mortgage Can I Get With PNC Bank? PNC offers a full suite of mortgage loans suitable for a variety of hopeful borrowers. And anyone can apply for a loan from PNC Bank — you don’t have to be a PNC bank customer to get a mortgage through the company. Fixed-rate mortgage: With a fixed-rate mortgage, your payments and interest stay the same for the course of your loan term. Depending on how much you’re willing to pay per month, your term can be anywhere from 10 to 30 years with PNC. It’ll depend on what your finances and what terms you qualify for. Single family loans can go up to $424,100 and down payments can be as low as 3%, depending on financial factors. Fixed-rate mortgages are considered conventional loans, meaning you generally have to have good credit to qualify. Adjustable-rate mortgage: Unlike fixed-rate loans, your interest rate will change in one-year periods following the initial term with adjustable-rate mortgages. The appeal of this type of mortgage is that the interest rate is usually lower than a fixed-rate loan, at least initially. PNC offers adjustable-rate mortgages (ARMs) in one, three, five, seven or 10-year periods, where your interest rate is locked for that amount of time. After the initial term, the interest rate can go up or down. This loan is more popular with those planning to sell a home within a few years of purchase, rather than stay long term. Jumbo loan: For home purchases over $424,100, PNC offers fixed-rate or adjustable-rate jumbo loans. You can finance up to $5 million, and for select markets your down payment can be as low as 10.11%. PNC offers jumbo loan terms between 15 and 30 years. Federal Housing Administration (FHA) loan: As a government-backed loan, FHA loans can be an option for homebuyers with certain circumstances. If your credit doesn’t qualify you for a conventional loan, an FHA loan is one option that may be available to you. FHA loans do come with some government requirements, such as mortgage insurance premiums, however down payments can be as low as 3.5%. This type of loan is available as a fixed-rate or ARM. VA loans: Department of Veterans Affairs loans are reserved for military involved individuals, including actively serving service members, veterans, certain eligible spouses, National Guard and Reserve servicemen. This category of loan is available as fixed-rate or ARM, and down payments can be as low as 0%. This loan does have a VA funding fee and a few other stipulations such as a VA home assessment prior to mortgage approval. Combination loans: PNC offers this type of loan that can help consumers purchase a home with as little as 10.1% down. The loan’s offered as an 80-10-10 combination loan meaning a mortgage for 80% of the home’s value, a home equity line of credit for 9.9% and finally a 10.1% cash down payment. This type of loan is useful for borrowers hoping to avoid private mortgage insurance, which is usually required when you don’t contribute a 20% down payment. Refinance: Whether you want to refinance for a lower interest rate, or you need cash to pay off other debt, PNC offers a wide variety of options which correspond with its mortgage choices. Choose between: conventional (fixed-rate or adjustable-rate), FHA streamline or cash out, VA streamline or cash out, home equity rapid refinance or a combination loan. PNC offers information on each type as well as loan officers to assist you in your choices. What Can You Do Online With PNC Mortgage? PNC Mortgage as well as PNC Bank (its parent site) offer fully comprehensive, easy-to-navigate websites. You can start the mortgage process online by applying for pre-approval or start your loan application. All the documents you’ll need to provide are listed out for you. Other features that come in handy include glossaries and step-by-step guides for the entire home buying experience. One of PNC’s features that make it stand out from the crowd is its current mortgage rate information. 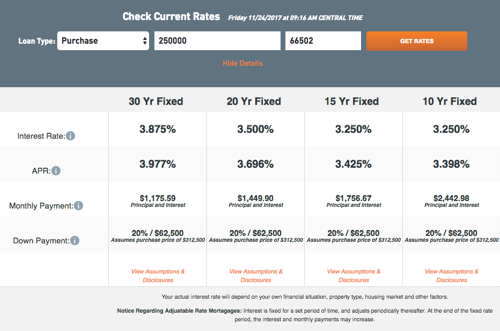 On each mortgage options page there’s a zip code box, purchase price and drop down menu. If you input that information, you can immediately see a box of current terms for a variety of loan options. For example, if you input loan type – purchase; loan amount – in dollars and enter a zip code, you’ll see rates for 30-year fixed, 15-year fixed as well as a few other options such as ARM or FHA. Even better, you’ll see estimated monthly payments for each loan type. It can help you get a better idea of what your payments will look like with PNC’s interest rates and loan types. PNC also has a landing page all about home lending, with links to things such as payment options, explanations of things such as home equity and frequently asked questions. PNC embraces a digital mortgage process with what it calls the Home Insight Tracker. This application allows you to upload all the necessary mortgage application documents and track each step of the process. You can also send secure messages to your home lending team through the application. 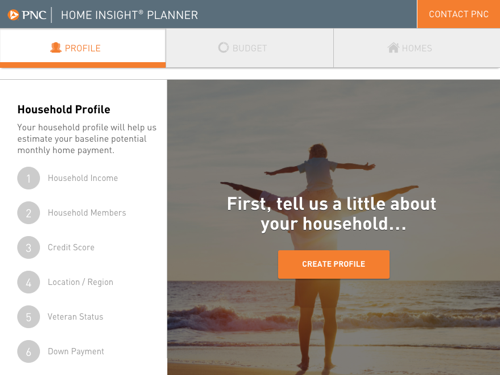 In conjunction with the tracker is the home insight planner. If you’re not quite ready to apply for a mortgage, the application helps you determine a mortgage payment you can afford. And if you’re already a PNC customer, you can use your login to manage your mortgage and make payments without having to sign up for another account. Does PNC Mortgage Operate in My Area? PNC originates mortgages in all 50 states. However, not all states have physically present loan officers. Use the loan officer locator on PNC’s website to find your nearest representative or call the main mortgage line. For PNC Bank itself, you can find locations in: Alabama, Delaware, District of Columbia, Florida, Georgia, Illinois, Indiana, Kentucky, Maryland, Michigan, Missouri, New Jersey, New York, North Carolina, Ohio, Pennsylvania, South Carolina, Virginia, West Virginia and Wisconsin. Would You Qualify for a PNC Bank Mortgage? Like most lenders, PNC will crunch a variety of numbers to determine your eligibility for a loan. One of the easiest ways to get a snapshot of a borrower’s financials is through credit scores. If you’re looking for the best rates and a conventional loan, PNC will likely look for around a 740 (or an “excellent”) score. If you’re close to 600 or below, in the “fair” range, you’re options will likely be limited to a government-backed loan, such as an FHA. PNC Bank doesn’t specify what scores are required for each loan, as other factors may influence whether you’re approved or not. You’ll have to initiate a pre-approval application or speak to a loan officer to find out for sure. It’s always advantageous for homebuyers to try to improve credit scores prior to applying for a new loan. That way, you can qualify for the best rates and pay less money in interest over the course of the loan. Your debt-to-income ratio is another aspect of your financial review. To calculate your debt-to-income ratio, take your monthly liabilities, such as child support, auto loans or credit card debt, and divide by monthly income. If your salary is $60,000 a year, your monthly pre-tax income is $5,000. If your total monthly liabilities add up to $1,150, your debt-to-income ratio is 23%. Find that number by dividing $1,150 by $5,000 and multiplying by 100. That percentage helps lenders determine whether you’d have enough money available for monthly mortgage payments. PNC recommends a maximum debt-to-income ratio of 40%, but you’ll increase your chances for a conventional loan (and better interest rates) with a lower percentage. What’s the Process for Getting a Mortgage With PNC Bank? The first stop for hopeful borrowers should be PNC’s HomeHQ site. You can find all sorts of information that’ll help you learn about the home buying experience. Through its calculators and rates, you can estimate what your potential costs will be, and if the payments will fit your budget. Ready to start shopping for a home? If so, you’re ready to get pre-approved. A pre-approval is a written commitment that shows how much money you qualify for in advance. This will let you know how much home you can afford and can be helpful during the real estate process. Pre-approvals are usually valid for 60-90 days. After that, you will usually need to reapply. To start the pre-approval process, you will need to provide a variety of financial documents, including: recent pay stubs, W2s and federal tax returns, bank statements, debt liabilities, divorce decrees (if applicable) and more. PNC will run your credit report to determine what rates you qualify for, and if you qualify at all. Once you gather your documents, you can call a loan officer, find an in-person location through the loan officer locator or fill out an online form. PNC advertises that it’ll take about 48 hours for pre-approval. Mortgage applications require much of the same information as pre-approval. 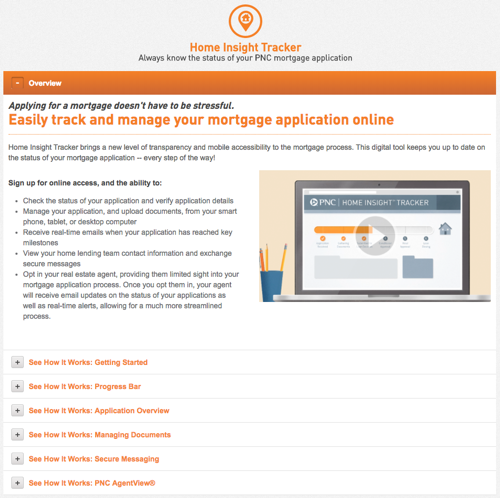 For this process PNC has its Home Insight Tracker, which is an application where you can track the entire mortgage process. You can upload required documents and communicate with your home lending team through the application. PNC will provide a loan estimate three business days after you submit an application. You will have to sign forms if you want to proceed with the application. Additional information you’ll need to supply include the past two months’ worth of bank account statements and any asset statements for stocks, bonds, IRAs or other funds you plan to use toward your down payment. As for personal debt, you may be asked to disclose any car, student or home loans not listed on your credit report, plus all credit cards. PNC will let you know exactly what information is required. Once PNC reviews your assets and income, you will likely receive final approval for the loan. After you receive final approval, it’s time for closing, which PNC states is seven to 10 days after the approval. At that time you’ll need a homeowner’s insurance policy, a certified check for all closing costs and a valid photo ID. As one of the largest banks in the U.S., PNC Bank offers the benefit of personal banking as well as mortgages. For some, it’s advantageous to keep all banking in one spot, but for others, that aspect may not matter so much for mortgage lender comparisons. It ultimately depends on your personal finance preferences. Regardless, compared to many mortgage lenders, PNC’s consumer offerings are well positioned. The mortgage site is useful and informative. It’s one of the more user-friendly out there with easy navigation and well-written explanations. With mortgage rates built on the site, an application tracker and easily available information, you won’t find yourself scratching your head about anything mortgage related. However, if you were hoping to absolutely everything online, you’re out of luck. At some point you’ll need to speak with a loan officer either via phone or email. Rocket Mortgage, part of Quicken Loans, is an option if you’d like to keep everything digital and rather not speak to anyone in person. The biggest downside to this lender is its lack of accessibility for certain borrowers. If you’d like to speak with a loan officer in person but you’re not in one of the states that offers one, PNC Bank may not work for you. Additionally, PNC Bank itself only has locations in 19 states. As for PNC’s loan offerings, while it has a standard variety, Caliber Home Loans offers Freddie Mac and Fannie Mae programs on top of other low income FHA and USDA loans. And Wells Fargo, another large bank, offers special mortgage options to categories such as Union members and military. If you’re not looking for one of those programs however, you should be fine with the conventional loan options available, but for others, it may be a deciding factor to go with a different lender. Prior to applying for a mortgage, try to figure out which types of loans you're most interested in exploring. This can help you quickly and significantly narrow down the lenders you're looking at based on the specialties that each possess. Professional help is a quick way to become an "expert" in any financial area, including mortgages. There's no quicker way to get paired up with a financial advisor than the SmartAsset financial advisor matching tool, which can set you up with as many as three in your area by taking the time to answer a few personal finance questions.